A Pennsylvania Railroad train soon will pass under the Erie Railroad's Portage High Bridge in this 1951 photograph. The train is heading south along what had been a century earlier the route of the Genesee Valley Canal. 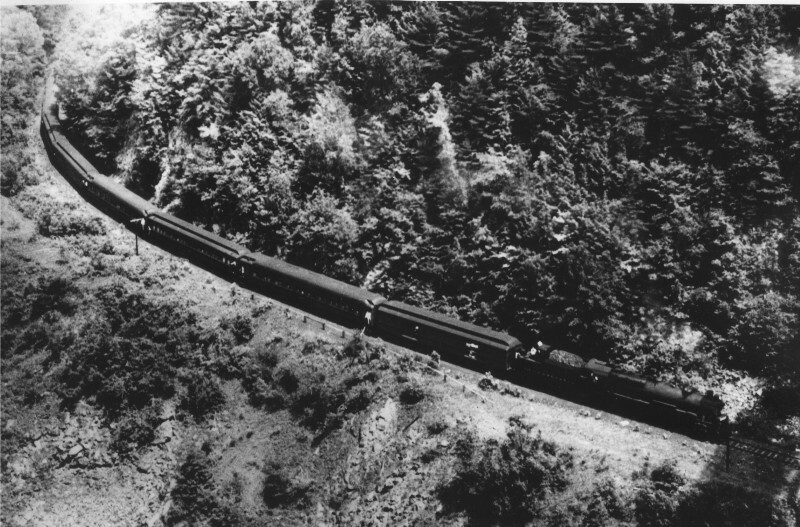 Train service on the tracks ended around 1963. The old canal and rail route is now Trail 7 in the Park. For more images 16, 86, and see our "Pieces of the Past" pages entitled "Along the Old Pennsy". This image is in the collection of the Genesee Falls Town Historian. We thank Town Historian John Quinn for allowing us to use this photograph.